Issues: together and separate, properly written attack descriptions; use the color descriptions used in the Ultimania or Bradygames guides. This Unversed likes to attack in swarms. There's no time to rest: destroy them as quickly as possible! Taking them out one by one is a waste of time and energy. Use commands that cover a lot of ground to take out oodles at once! These floaters are known to attack in groups, and sometimes even entire colonies. Each color is weak against a different element, making it hard o put the kibosh on their collective jiggle. When in doubt, start smacking them with the Keyblade. 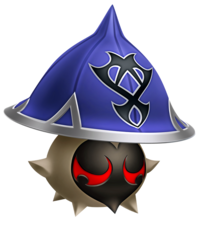 The Jellyshade is an Unversed that is found in Kingdom Hearts Birth by Sleep. They always appear in gigantic swarms, and can even be found on the Lanes Between. Jellyshades come in several different colors defining which element they are weak to, but they all share the same structure. A Jellyshade is a small Unversed with a round head with several short spikes on it. 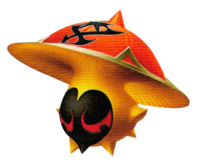 Above its head is a large, rounded cap with a short spike on its tip. 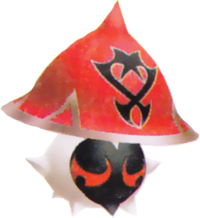 All Jellyshades have the same black, heart-shaped face with red eyes set in an angry expression. Their caps all share silver highlights and an Unversed symbol on its front. The four different color variations of Jellyshades include a light brown head with a blue cap, a pink head with a cyan cap, a cyan body with a yellow-green cap, and a light orange body with an orange cap. Jellyshades are able to contort their caps to propel themselves. 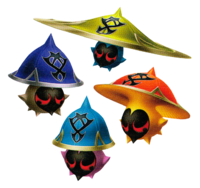 In Kingdom Hearts Birth by Sleep Final Mix, the Jellyshades are given new colorations. 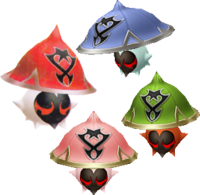 One form has a light pink body with a pink cap, one has a light blue body with a dark blue cap, a third form has a white body with a red cap, and the last form has a dark orange body with a green cap. Jellyshades, while weak on their own, can be deadly and unpredictable in a swarm. They attack by randomly ramming at the player. 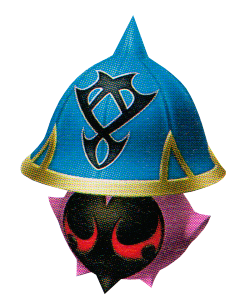 Their HP is also very low; the easiest way to defeat a swarm is with Magnet or Aero magic. Another strategy if caught in a swarm is to use Terra's Ultima Cannon Shotlock as it can clear large groups in one blast, although other Shotlocks function nearly as well. Rush (体当たり, Tai Atari? ): Charges at the player. Spinning Wave (スピニングウェーブ, Supiningu Wēbu? ): Stays immobile, the top of the Jellyshade becoming saw-like, growing longer and glowing. Poison Powder (ポイズンパウダー, Poizun Paudā? ): Releases poison from its body, poisoning the player on contact.